My girlfriend stayed with me for the first two weeks of September 2013. I live outside the city, in the countryside, surrounded by trees and forest and animals and a creek. There is a small amount of light pollution, but not a lot when my exterior lights are turned off. There is one street light near the main road about 300 feet to the south-east, through the trees, but even with my exterior lights on, the night sky is brilliant on a clear night. We found that we both liked to stop and look up and marvel over just how many stars were visible from my front yard, and how bright and clear they were. So by the second week, we had started turning off as many lights as possible and going outside specifically just to stare into the sky for 15-30 minutes. I sometimes brought my smartphone or tablet with a SkyMap app just so that I could use it as a reference when we spotted something particularly bright or interesting. I was surprised to find that most of the time, an overly bright star would actually turn out to be one of the planets. So I was indeed lucky to see a shooting star. 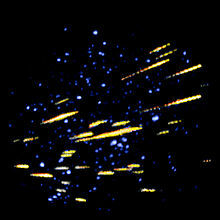 (I’ve included a short animation above of a meteor from Wikipedia.) I should mention however that the one I saw lasted about 2 or 3 seconds, and didn’t seem to have the long tail. Looking at this animation though, the fireball at the head of the meteor is considerably larger and brighter, therefore I would just assume that the tail was too faint for me to see. How exciting and romantic, a shooting star! Meteors, Let’s Not Get Too Carried Away! Now this is, from my perspective, where it starts to get a bit unusual. Very soon after the first shooting star, I saw another one. And then another one. And then another one. They were going in different directions. Then my girlfriend saw one. And another. And I saw even more. And she saw even more. Sometimes we’d each see one at the same time, but often it was different meteors, since we were often looking in different parts of the sky. After about 30 minutes, I had seen about 8-12, and she had seen about 4-6. I wasn’t really counting them, I was trying to spot some to point out to her so she would see many as well, since they seemed to be coming pretty continuously. I mentioned something above that strikes me as very unusual. Many of these meteors were going SE to NW, or S to N, or E to W. So generally from the SE quadrant to the NW quadrant. But some of them were going in completely the opposite direction. There were two or three that went due west to east. One went north to south. I just ignored this fact because I assumed… well I don’t know what I assumed, just that this was normal I guess. Later when I read a bit more about meteor showers, they were described as originating from the same area in space, and so would be generally going in the same direction, as in the extended exposure image on the right (from Wikipedia). But I was really just grateful for having a chance to witness the extraordinary sight of many shooting stars. Then something very VERY strange happened. A quite bright star seemed to appear to the north-east. It seemed like it must be the brightest star in the night sky. I wondered if (and how) I had just missed it, or if it had been behind a cloud. It was visible for about a second and then vanished. For about a second. Then appeared again, just as bright as the first time, for about a second again. Then disappeared again. I wasn’t sure if I was really seeing it until it stopped doing this, and I realized it had flashed on and off four times, in a very regular pattern of about one second on, one second off. Repeated four times. A few minutes later, after maybe about 5 minutes had passed, it reappeared about 15 degrees or so to the left of the first location (closer to the north). And I say ‘it’ reappeared, because the new bright star was about the same magnitude as the first flasher, roughly in the same part of the sky, and again it flashed four times at approximately a cycle of about one second on, one second off. Again. It was almost as if it was answering my question — yes, you definitely did see that the first time. Then it was gone. I stared. It was a bit shocking to me, like when you joke about seeing something (e.g. like a bear along the treeline) and then it turns out to actually really be there and makes you jump. Combined with my girlfriend seeing the first observation, that’s three times we saw the four-flash cycle. I was overwhelmed with one thought… that it looked unnatural. That it wasn’t a plane, it wasn’t a star, it wasn’t a satellite, it wasn’t a meteor… WHAT WAS IT? What appears, flashes four times in a regular pattern, then disappears? What does that TWICE (three times actually), in similar but different locations in the sky, about 5 minutes apart? The following night, of course we went back for another look. After seeing so many stars, and something unusual, we were hooked on staring at the night sky. Neither of us saw any of those mysterious flashers the second night, but we did see many of these shooting stars, again moving in different directions. About half as many as the first night, so between the two of us, we saw roughly 6 to 10 shooting stars that second night. Four and a half months have passed since that night. I haven’t seen any more incidents like this one since then. I still don’t know what the heck we saw. I’d say we caught one of the best meteor showers ever, except that they don’t really fit the usual description of meteor showers. And then there’s the 4-pulse flashers. I have no idea what they were (or it was). But none of this would be enough for me to stop to blog this. It’s what happened in February 2014, when added to the September incident, that really has me a bit wound up. That story is coming next. However, for some time now, I have been investigating the videos submitted by others, from unusual weather, to aircraft, and UFOs. I have been looking for similar sights, and the closest thing I have found to the flashers are some of the videos showing UFOs responding to laser beams with a strong light pulse. In my case, I did not use a laser, and the light wasn’t visible (to my naked eye) until it pulsed. So I haven’t really found a good match. But it was something. I’ve slowly been opening my mind to the fact that we may not be alone. After looking at the huge bulk of video and testimony out there, the evidence is actually very overwhelming. In addition to the many videos available online (here’s one video with a good collection of just 2013 incidents), there is also the witness testimonies in the Sirius Disclosure project, part of the CSETI organization. And for a community of like-minded people to help and discuss, there is the http://etletstalk.org/ website and the discussion forum there. They are out there, in great numbers, all over the planet, and have been here for decades (if not thousands of years). Now my big question about those two nights is whether I saw any of them on either of those nights, and if so, was it the “streakers” or the “flashers”? Or both? And if it wasn’t a natural phenomenon, what was the purpose of the four flashes? Was that a signal? I had my girlfriend read this over for accuracy. She reminded me that when I did ask if she saw it, she had not seen that one, BUT she had seen something very similar moments before. So she actually saw a “flasher” first, before me. So that was three sightings of one that night, one by my girlfriend, then twice by me. I’m just glad I saw it twice so that I wouldn’t be questioning if I really saw it or not, and whether it was that regular. I am a software developer. I am used to the difference between say, 600ms and 900ms. This was very close to 1000ms pulses. I can’t say for sure but I’d say it was +/- 100ms and very regular. Whatever the timing was, it was the same, four times: on, off, on, off, on, off, on, off. I think you definitely ‘saw’ a planned interaction. so, WOW! carry on! Join the CE5 group and report! you don’t always have to report in the monthly blog. Just start a new topic. cool beans, and carry on. The one comment I have about why the group is good is that, the more minds operating together, the stronger and more coherent the thought, and therefor more successful even if you are by your self. Hooking up with everybody else at same time period through intent tends to create a high percentage of positive results. Just a thought…. Thanks again for the encouragement and help. Yes, I have read where others have felt that the connection between the minds helped magnify the thoughts, and also Bright Garlick’s comments that even connections with the earth, plants and animals around us also (likely) helped. I too believe there is a very good chance that it all helps, and even if it did not, there’s very little chance that it would hurt, and so there is little to lose by trying to sync up with others. The night in question above was a rare event and one of the few times I was not alone, so that also adds credibility to this concept. I appreciate your support and look forward to CE-5 events, and strengthening the connections with others. Thanks again.